As I sit here to share this with you all, I’m not sure how I feel: excited, overwhelmed, a little embarrassed to have the spotlight on me? When I decided to start a blog last fall, I didn’t expect this. I just wanted to share my love of fashion and my really cool leather baby bag with you and maybe have some fun in the meantime. I can’t quite even remember the first time I knew I was going to share my story and struggles here. It wasn’t an all at once “aha” moment for me. It was a gradual one. As I recovered and got better, I realized how many stumbling blocks there were in my path to treatment for PPA and how afraid we are as mothers to share our suffering. Will we be perceived as a bad mother? Will we face dirty looks? Will CPS come knocking at our door (this has been my number one anxious thought- the idea that I will be deemed unfit but my decision to seek treatment does nothing but prove my fitness to care for myself and my family)? I have been sharing my story in the hopes that we will raise awareness and maybe change the perception of PPD. It is not something you can control, it is not because you didn’t pray hard enough or get enough exercise. It isn’t about being a bad mother. It isn’t because you don’t love your kids. It is a hormonal and psychological imbalance that can be treated- with therapy, medication, supplements, and even essential oils. Accepting that idea has allowed me to be more open about what I’ve gone through and I will continue to share my story and hopefully it helps someone else along the way. Over the weekend, I had a whim to try to get my story out there. I mentioned it to my husband and he suggested The Daily Mail. I sat there in the car driving to my parents’ house and typed out a quick email to an address I found in a five second google search. Much like everything to do with this blog, it was spur of the moment (read not really thought out). I never expected to get a response Monday morning and an interview a few hours later. I never meant for it to be a story so focused on me and my experience (I sent them my story and Jonathan’s story but also the one featured in the article about the less common signs and symptoms of PPD). In fact, I thought it was going to be a quick blurb about me and then a link to some of my already posted blogs. I have always been shy, and somewhat (or sometimes very much) introverted. I can still remember the knots in my stomach waiting to be called on in class in high school. The nervousness I experienced every time I went to my Journalism 101 class in which we were required to participate at least three times per class. I’m a Leo so you’d think I love to be the center of attention and in some circumstances I do (I mean I did start a fashion blog, I can’t hate the limelight that much). Yet, as I sit here preparing to share this article with you, I feel that same pit in the bottom of my stomach. Now, it’s a mix of trepidation about having an article written mostly about me (am I really interesting enough for that??? I mean I spent the morning moving laundry around and wiping snotty noses) and excitement of sharing my story and raising awareness for something I feel passionate about. All those negative thoughts I shared yesterday run through my head (Am I self involved? Will people think I’m just looking for attention? Did I share too much? Is my story too dramatized? Does anyone really want to read a story all about me and if they do will they think all those horrible things I’m trying to change about myself?). But, when I decided last winter that I was going to put a new face on Postpartum Depression, this is what I wanted to do. Raise awareness, share my story and the stories of so many other mothers who have battled similar (or all to often worse) emotional turmoil. So, I’m sharing this with you now and I hope you’ll take it for what it’s meant and maybe it will make you think just a little differently of that mother you see on the verge of tears in the grocery store with 2 children in her cart and an infant on her chest. Maybe, we will start asking the important questions during pregnancy and postpartum about mental health. And, most importantly, maybe sharing our stories will help other mamas who feel alone to know they are in fact not. Because, we are the face of Motherhood, we will not be ashamed, we will share our burdens together, and maybe somehow that will make them just a little easier to carry. Think you or someone you know may be struggling with postpartum depression, anxiety, or another mental health disorder? Please contact your health provider including your OBGYN or family doctor. Need more information? Visit Postpartum Support International for great information on maternal mental health and more. If you fear you or someone you love may be contemplating suicide or facing a mental health emergency, call the Suicide Prevention Hotline and get to your nearest emergency room. Please consider buying a PPD Awareness t-shirt, all proceeds go to help mothers in need. Have questions or need support please join the discussion on Facebook. PS I want to give a quick shout out and thank you to my husband for supporting me through this journey. Reading his article was emotional and touching for me. Fathers go through so much and I think we also forget that. Also, to all you mamas who helped me and shared your stories through the “we are the face of motherhood” campaign, thank you for your encouragement and participation- we’re doing it!! 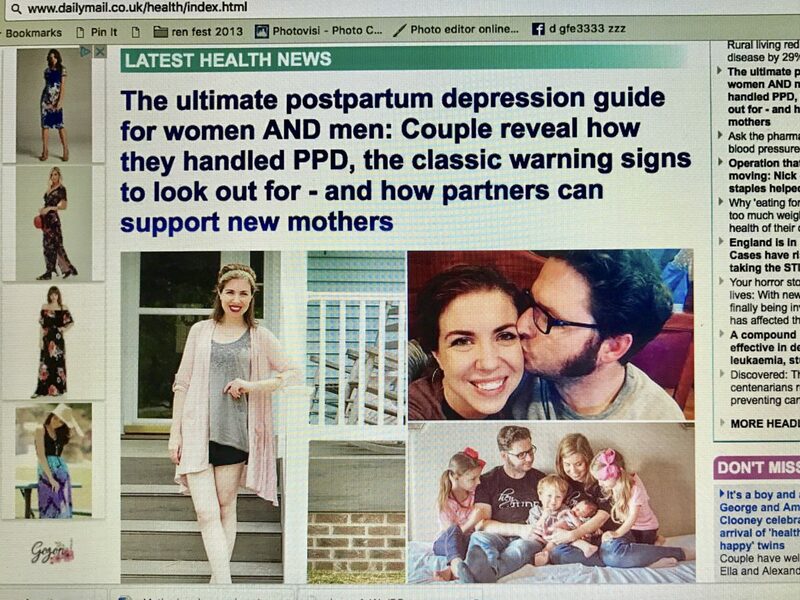 We’re raising awareness and hopefully people are beginning to realize that the face of PPD could be any new mother. You all are an amazing community and I’m blessed to have connected with so many amazing women.